Cosonok's IT Blog: Does 7 to C SnapMirror Initialization Hold Up Scheduled 7 to 7 Updates? Does 7 to C SnapMirror Initialization Hold Up Scheduled 7 to 7 Updates? NO. 7 to C SnapMirror initialization can run at the same time as scheduled 7 to 7 updates*. We have a simple lab. 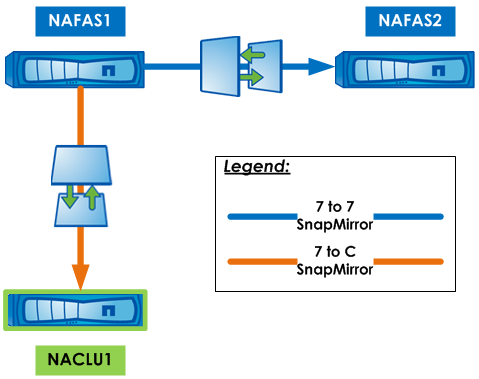 Two 8.1.2P4 7-Mode systems - NAFAS1 and NAFAS2 - are SnapMirror-ing to each other. And we’ll setup a TDP Mirror (Transition Data Protection Mirror) to a CDOT 8.2.1 single-node cluster - NACLU1 - with a Storage Virtual Machine (SVM) NASVM1. We have a 10g volume called testvol on NAFAS1, with a share called testshare. This volume starts off empty whilst we setup the 7 to 7 Volume SnapMirror relationship from NAFAS1 to NAFAS2, and 7 to C relationship (but we don’t initialize it) from NAFAS1 to NASVM1. Then we’ll add ~2.5GB worth of data into the volume (since we’re running in a SIMBOX, this is plenty of data for the experiment), trigger a 7 to C SnapMirror initialize, followed right-after by a 7 to 7 SnapMirror update, and see if the 7 to 7 SnapMirror update is held up. Note: This uses the lab setup of previous posts. MSADM1 is an admin server that here we simply use for mapping shares to. Note: Since we specify no schedule it has none. Add ~2.5GB worth of random data. What happens to the SnapMirror Update? Initialize the 7 to C SnapMirror and see the 7 to C SnapMirror transferring. Operation is queued: snapmirror initialize of destination "NASVM1:testvol". Then we kick off a 7 to 7 SnapMirror update, and see that the 7 to 7 SnapMirror update is proceeding at the same time as the 7 to C SnapMirror is initializing. We see testvol on the source has 3 “busy” SnapMirror snapshots. The 7 to C SnapMirror initialization finishes. The 7 to 7 SnapMirror update finishes. Our source has two SnapMirror snapshots - one for NASVM1, the other for NAFAS2. “1) Each 7-Mode controller can only support a certain number of concurrent replication operations. Please refer to the Data ONTAP Data Protection Online Backup and Recovery Guide for more details about the limits. “2) If the source 7-Mode controller is already serving the maximum supported current replication operations, the next subsequent requests will fail till current replication operations have finished.